Gavita is responsible for finance appointments ranging from £70’000 to £250’000 base salaries. She has over ten years’ recruitment experience, specialising in permanent senior finance recruitment to blue chip organisations across the UK. 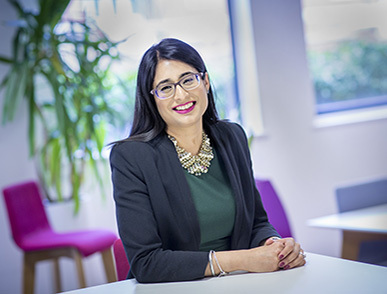 After graduating from Royal Holloway, Gavita joined a large international recruitment firm and achieved considerable success across the telecoms, technology, energy and utilities sector. Due to her market knowledge and ability to source the right professionals for her clients in terms of culture, ability and aspirations, she achieved regular promotions and eventually took a leadership role, managing 3 disciplines across the Home Counties. Outside of work, Gavita is passionate about food, constantly experimenting with new recipes and baking as well as fitness, particularly weight training. She lives near Windsor with her husband. Enter your email address below to subscribe to our news, updates and Insights. Member of the Association of Executive Search and Leadership Consultants (AESC). Ranked 2nd in the 2018 Institute of Interim Management Survey. Member of the Interim Management Association and REC. Member of the Employers Network for Equality & Inclusion. Sponsor of The Non-Executive Directors’ Association.